In stock 210 items in stock. I agree with mrRed. In my case, the adhesive fell off the feet before they arrived. Without the feet, the breadboard does not lay flat. My next order with be with someone else. Dude! Chill! Not everything you order online will be perfect. I learned that about 597 times in 5 years! Mine didnt come well either. Mine for some reason it was like the internal rows of metal (that you push the wires into) was slightly pushed to the left (when looking at it from top). So for the first month it was very hard to push anything into and I would often bend leads by accident. I would use a pair of pliers and push them in. Then I went crazy one day and literally used some headers and pliers and pushed through each hole... which re-aligned it, so now it working properly. I just think SF should get a replacment item; one with higher quality. I mean they mark this stuff so far up anyways what would another 3 bucks mean for higher quality. You can just peel off the foam on the back and push the metal rows over. I agree, I'd rather just have the breadboard. The adhesive on the feet is terrible. The rubber feet are pretty much useless with the included adhesive. I spent a couple of nights trying to get a circuit working only to find there is a break on one of the power busses. The ground on the upper bus was broken halfway through. Go through with a continuity tester if there are any issues or rip off the foam on the back to check for breaks. Solid breadboard otherwise, but not wide enough for the bluetooth DIP module. It's supposed to be like that, so that you can have up to 4 different power sources. It says they're disconnected in the middle in the description. It is? Mine it not broken in the middle. Also it should be shown on the board by a break in the blue/red line. Why does mine not have breaks in the middle. I think they meant from top and bottom; not middle left to right. As this is standard for breadboards. *edit: now i have seen more comments. why are some broken and some are not? differnt versions of the board? thats very annoying.. im glad mine doesnt have the split. and larger boards often break up the row into 2 parts (great for when some stuff needs 5V and other stuff needs 12V). As JLC says... Can we get just the breadboard? I would like to lock several together on my workbench. I have the radioshack version, but it is now discontinued. 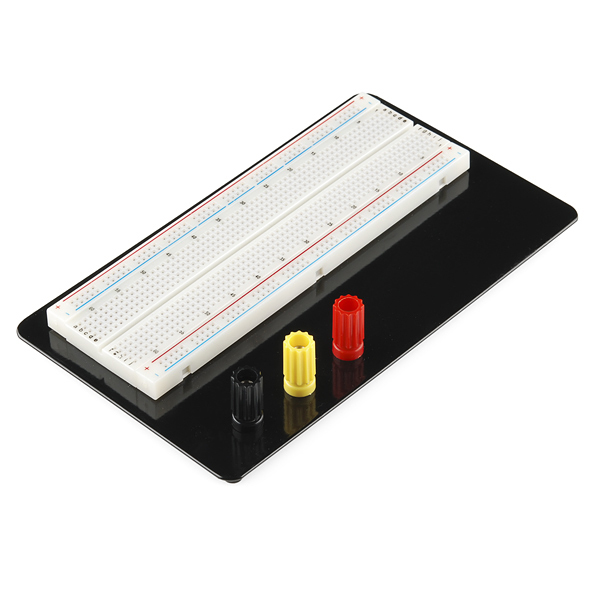 Overall this is a pretty nice breadboard. The back plate is metal so it is pretty solid and durable, the screw terminals are nice as well. The power buses have a split at the halfway point. This is part of the design, if you want to use the entire bus just use a short wire to jump both halves together. It is pretty useful for a 12V battery bus to run motors and a 5V logic bus from the Arduino's regulator to run LED's, chips, etc on the same breadboard. The only issue was that the adhesive on the rubber feet is terrible. The feet themselves are nice, just the paper had already been removed and the adhesive wasn't sticky at all when I took mine out of the package. I just used double stick tape and it holds great. P.S. Before anyone points it out the Binding Posts in the related products are too big they are not the same as the ones used for this breadboard. Just wondering if you ever found these? I'm looking for them right now and having a hard time. Cheers. Are the posts removeable? It looks like they are, but can I get a confirmation. If they are, it looks like you could fit two mini modular breadboards on the side. 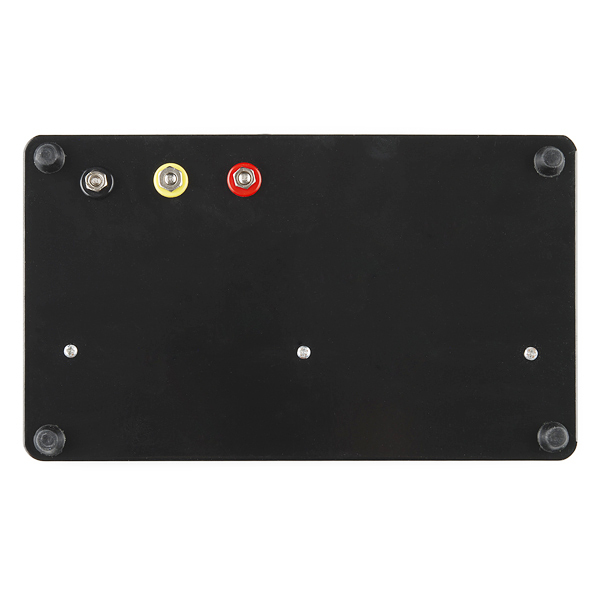 The very first thing you want to do after getting this one is to connect the metal plate electrically with the black post (assuming that's the one you'll be using as the ground connection). The metal base serves as an excellent antenna for picking up the mains frequency from the air and radiating it back to whatever you're breadbording. And that's usually the last thing you want. I've wondered for some time why the signal from my opamp-based low signal microphone amplifier was swinging up and down until I realized that. Just connect the black post with one of the small Philips screws underneath or otherwise undo the electrical insulation between the GND post and the plate (by scraping the paint or whatever) and instead of spewing the interference on your circuit, the metal plate will serve as a great shielding from now on. Somebody who is new to the whole DIY Electronics. I have a quick question. What are three binding posts for? I have a feeling that the answer will be fairly simple, but I can't really figure it out. Some test equipment and power supplies use banana plugs. The posts make it easy to connect banana plugs to your breadboard wires. You can then quickly reconnect a project when moving between work benches in a lab or after your breadboard has been on the shelf. They are not "meant" for anything special, but people typically use them to connect power to the posts, and then a wire from the post to the board. This way you don't have long power wires flying around and coming off at the slightest movement. I use 3M breadboards that I obtain from Mouser. Yes, they are triple the price, but they are durable boards, made in the USA, and I have had no issues with them, and couldn't be happier with what I use. The way I look at it, I can buy cheap stuff that will... disturb me, or I can bite the bullet and buy quality and be happy that it is one less thing I have to worry about. I read people complained about the rail and feet, but my main problem with this is that it is impossible to insert anything into it. With a lot of power, I can insert a premium jumper wire, but I wouldn't dare putting 20x that pressure on a Atmel chip or something else with 4+ pins. It says right in the description: "Who knew it would bring so much frustration?" Bottom line: Sparkfun is great, but not their breadboards. just wiggle it a bit and it will go in. the premium jumper wires are kinda square and the breadboard is like a slot. the non-premium wires are just a thick piece of metal, so the round peg fits a bit easier... does that make sense? ICs should fit in just fine. Wiggling does the trick. They work different from what I originally thought. ps you have some html escaping issues. yeah, the tolerances for a $10 breadboard aren't all that tight (not surprisingly). plus, you ultimately want tight connections. In a nutshell, the product I received was quite clearly not the product advertised. -no labels, and a much lower build quality overall. Of these, the unbroken power bus is the most significant since it limits the use of the breadboard. The overall quality is quite craptacular - the sort of thing you'd expect to find in a $2 store (and priced accordingly). After emailing Sparkfun, they gave me a refund. Say what you will about the breadboard, their customer support is excellent. Same here. had a dead short between the power rails and melted one of my new jumper wires i got when i orderd this thing. oh well fixed the short. work for now. If you look at the iso view above the rail on power rail on the bottom is missing some plastic between the tow busses thats were mine shorted. In all honesty I would never buy this again and refuse it if it is given to me for free, the haste to get this breadboard to "function" is ridiculous. Does it comes with the board sticked to the metal plate? I want to use just the board itself. It comes all combined, with the board stuck on the metal plate. Just a nit, but mine also had a red, yellow and black binding post. No green. This just arrived and I'm new at this, but I agree with other posters that this product needs improvement. The foot adhesive wanted to stick to everything but the foot, the factory didn't cut the rubber all the way through in the intended spots. Also, the binding posts are awkward to attach and seem like they won't stay on long, if I even end up using them. The Ground (blue) and Voltage (Red) rails nearest to the binding posts are connected so I can only ground or pass voltage to either rail and it jumps to the other rail. Just noticed this, debating if I want to go through the trouble of getting it replaced. Otherwise it is a good breadboard of medium size. A nice breadboard, unlike other people are saying, my feet did NOT require extra adhesive, and the power rails are split in the middle... except one. Both the + and - rails on one side are split, but on the other side only the - rail is split. This was a little annoying, but I easily joined all the rails with some small jumpers, and I'll probably open it up eventually for a better fix. I took a look at a few of these and it looks like some of the breadboards come with all the rails split and some come with one or two of the rails connected. Bottom line is, don't count on the rails being connected. Minus: The adhesive on the feet... time to break out the Gorilla Glue. All 4 of the power buses were separated halfway through directly above 30 line mark on both sides. Buyers should be warned before using as I suspect this is a common problem. Also, the negative and positive power buses were connected on one side. Continuity testing is a must before using, but its easy to fix and still a good buy. The separation at 30 is by design. It allows you the option of having two different voltages on your bus. They point this out in the beginning electronics tutorials. The 2 power buses on my board near the binding posts are fully connected. The 2 on the other side are split in the middle. I'm not sure if this is just bad manufacturing or an intentional "feature". I spent 3 hours trying to fix my project before realizing it was the breadboard that was broken. Also, the sticky feet were not sticky at all. The adhesive had long peeled off before I got it. I used some sticky-tak to put them on. Actually, I'm testing the continuity on mine right now, and only one of the positive buses are disconnected. The other commenter mentioned that one of his ground buses were disconnected. I suspect it's just a crappy breadboard (as evidenced by the rest of the design). So, if any of you are buying this, make sure to test all of your power buses for continuity. Final warning: 20-gauge wire is a little too snug for this board - you'll find yourself manhandling it a little more than you'd like to get the wires in. Stick to 22-gauge or thinner. Every breadboard of this type I have ever used is split on the power buses on purpose. I have a huge breadboard with 3 of the size on this board and they are all split on the power buses. This is by design and is "what you want". Many analog designs and some digital use 5,-5,12,-12,24,etc voltages. This would allow for 8 separate voltages on this board alone. This board looks to be of similar quality as the Archer versions. Edit: Okay, I am gonna eat crow. There is something strange about the power buses. They show continuity end to end intermittently. They are not broken in the center like every other board I have seen. They can't be relied upon to be broken in the center. I am going to scrape the sticky off to see if I can make them separate because that is what I want. I apologize if I misinformed anyone. I scraped back the sticky double tape around the buses. They are not a continuous bus. They are barely touching hence the intermittent conductivity. My recommendation: peel back the double stick at the center bus location and solder them together, or push on the ends to bend down the tabs so they don't conduct. Then put tape on them so they don't contact the metal base. This was my first purchase with your company so to me it kind of sets a standard for the future. my experience with this product is such, so far . When I opened the package the breadboard was on the bottom of the box with the other few items that I purchased. When I lifted the breadboard package out it was immediately obvious that it had been returned by someone else,the plastic sealing had been opened and the cardboard backing was tattered.Upon further inspection i could see the reason why it was returned. The aluminum plate backing was bent in several places, not really bad, but enough to warrant this a second, not a first like I had been expecting. I straightened it out and will keep it and hopefully the damage won't effect the usefulness of the product. So my first purchase left me a little under enthused with Sparkfuns QC . An update to my previous post; The Monday after the Friday that I posted my concerns about this product, Timothy from Sparkfun e-mailed me about my experience. He voiced his concerns about my purchase and wrote that a new board would be on the way to me post haste,,,, I have to say that I wasn't expecting that kind of a response so soon,, so thank you very much Timothy and Sparkfun. So here is the thing,,,,, when I got the new board I opened the box as before and found pretty much the same condition,,,, the board had broken free from its packing and the bits and pcs were strewn about. (but not bent) So it's looking like the travel has taken its toll on the board and not a case of negligence at the Sparkfun end,,,, at least thats my story and Im gonna stick with it. Thank you again Timothy and every one at Sparkfun. I would recommend this product based on its cost,,, maybe not the best but descent value for the dollar and the support at Sparkfun was pretty awesome. College gave me some pretty bad breadboards to use. This changed all that. 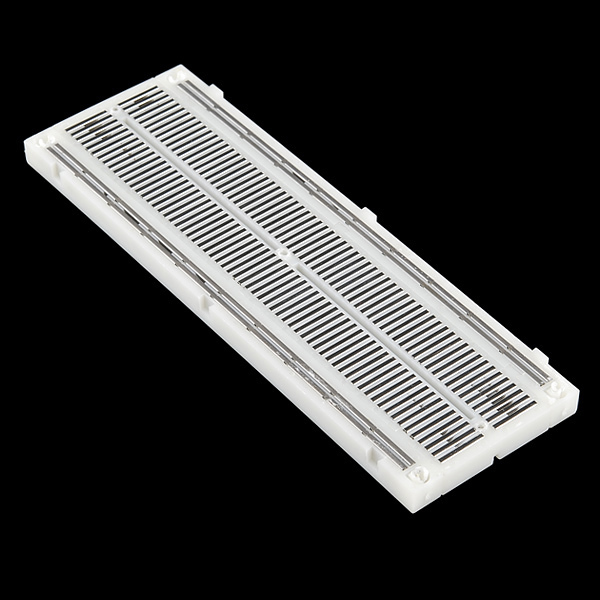 The power rails are great for dedicated power setups, and the bread board itself is fairly high quality. I still have a couple designs stuck to it that I will return to when I have time. (I did some moving between this purchase and now, and the parts are still on it!). This is a MUST HAVE for anyone that is doing electronics as a hobby. (I even used this to as the platform to program a few ATTiny85's). First thing I did was try stick the rubber feet on and the adhesive backing didn't stick to any of the rubber feet, so that didn't work. Then came the biggest issue. From one side of the power rail to the other, I measured 5 ohms of resistance. That's not much, but think if you're running a device that's powered by 3.3V, minimum voltage is 3.15V, and it pulls 150 mA. With the 5 ohm resistance, that equates to a a 750 mV drop, which doesn't work. I also had a lot of intermittent connection issues with the normal breadboard rows which caused my circuit to act strangely. I thought maybe I got a bad one, so I tried the second one out. Feet didn't stick, 3 ohms of resistance on this one's power rail. I'm sorry Sparkfun, but these things are junk! 2/2 failure rate for me. Feet didn't stick. Posts were hard to assemble. Would have been better off buying the component pieces and mounting it to a scrap piece of plastic or similar. 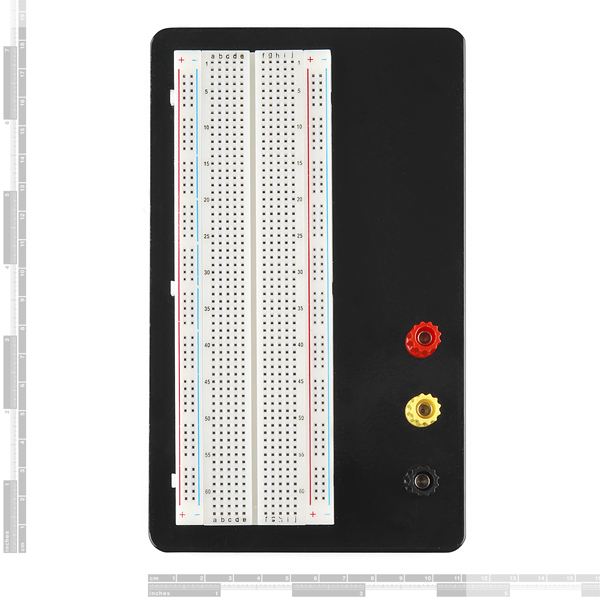 Hey what can I say it's a breadboard with lots of pins. The feet didn't stick well but a drop of cyanoacrylate solved the problem which I considered a minor annoyance not worth taking away a star. Overall well made board. Great breadboard, simple. I like the heavy plate attached to it, although I did order a second board without a plate for easier storage. All connections seem fine, I haven't run into any issues. Sometimes it's difficult to put components or wires in certain holes because it looks as if the underlying metal is not properly aligned with the holes in the plastic. Secondly, I don't like the way the posts are assembled. I stripped one of them trying to put it together and now I can't take it apart. Last thing was the rubber feet. When you peel them off the sticky stuff came off. I had to scratch up (to remove the paint) the bottom of the metal so I could superglue the rubber feet to the board. I think this has probably been on the shelf for a while. The glue holding the plastic packaging to the card stock backing had completely let go by the time it got to my house so everything was loose in the box. The yellow binding post was missing a piece so I can only attach the black and red ones, though the right washer would probably do it. The adhesive that holds two of the rubber feet to the bottom has already let go so now I need to replace them all. All-in-all it was a worse breadboard experience than I expected. So far the actual breadboard aspect of it seems to work fine though. I purchased this just to find that most parts are missing because the product package fell apart. As soon as I open the box I thought someone threw trash in it. I ended up getting the missing parts from another online company. I remember when Sparkfun used to be all about 100% quality assurance. The larger size (length) allows more complex test circuits to be assembled without tying in an additional board. Also I like the metal backing because of the added weight and larger footprint which makes poking in jumper wires and various other components/connectors easier. I have not use the power connectors, suppose they would be nice if you are using a large external power source. I use one of the breadboard power supply (obtainable from Sparkfun) for power hungry components which powers both rails and is switchable between 3,3V and 5.0V.